Korea’s DMZ, Nagasaki, Taiwan, Manila Bay. 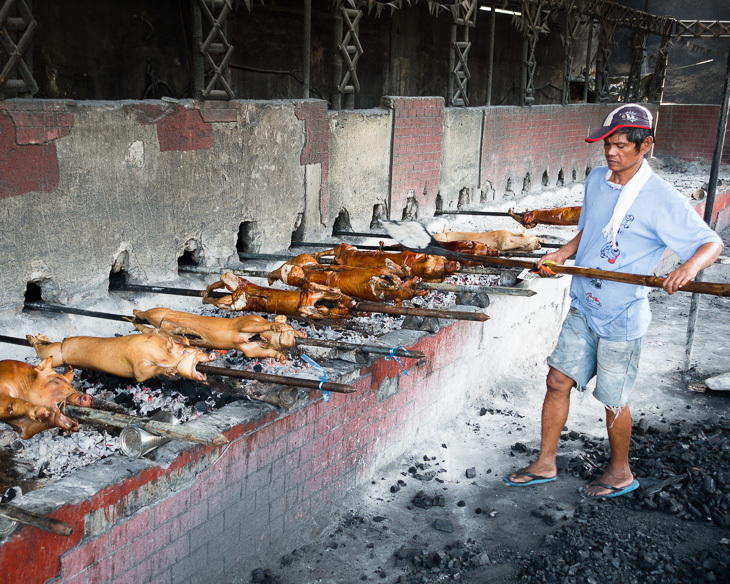 These places bring to mind unresolved Cold War conflicts, the tragic destruction of an atomic bomb called Fat Man, and famous World War II battles like Corregidor. The wars have not been forgotten. Some memorials are poignant, while others have become tourist attractions. In addition to military history, we saw modern cities, fishing villages, an active volcano, colourful temples, parks and trails, and young people who are talented and polite. South Korea, Japan, Taiwan, the Philippines – these are countries, not wars. “Did you have rice?” That is the greeting among the older generation, those who lived through the starvation of the Korean War. Tour guide Lucy tells us war history as our bus is en route to the Demilitarized Zone (DMZ), the weapon-free no-man’s-land that has separated North and South Korea since the Korean War ended in 1953. It’s a good thing we were given hard hats at the entrance to the Third Tunnel. Designed for a surprise attack on Seoul and capable of moving 30,000 battle-equipped foot soldiers per hour, the Third Tunnel has become a major tourist attraction. A mini-train escalator carries visitors up and down the tunnel, after which everyone walks for 500 metres out and back. Every tourist over 5’6″ bonked his/her head numerous times as we hunched our way through. The older generation still has family in North Korea, but the younger folks don’t feel the need for reunification as much, Lucy tells us. Today South Korea is a prosperous country. 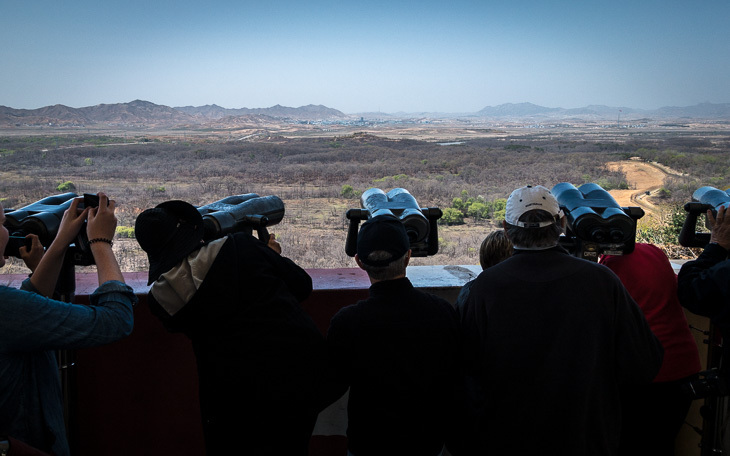 The DMZ Tour is a money-making operation, but we felt the tension, and we came away with the feeling that reunification does not seem likely in our lifetimes. Our connections to South Korea? Doug recently read The Orphan Master’s Son, in which the main character was a tunnel-runner. Cathy’s family lived in Japan 1951-1953 when her father was in the US Army (he was called up in the Korean War’s doctor-draft). We were moved and charmed by Nagasaki. 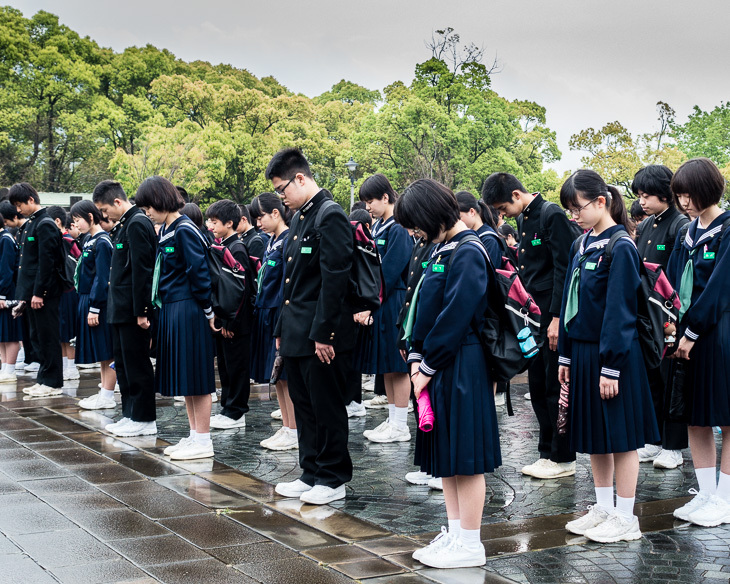 The emotional part is Nagasaki Peace Park, which commemorates the city’s destruction by the atomic bomb dropped on August 9, 1945. 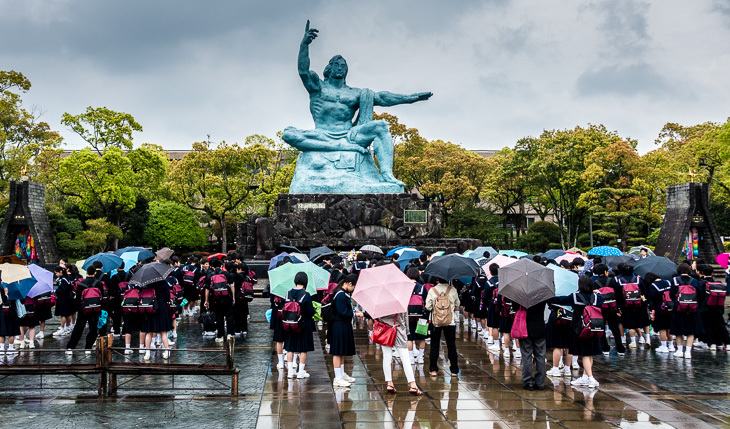 The park’s main attraction is the statue of man with his right hand pointing to the sky symbolizing the threat of nuclear weapons. His flat, outstretched left hand represents eternal peace, and his eyes are closed in prayer asking that the souls of the victims may find rest. The park also contains statues and sculptures donated in the name of peace by various countries and artists around the world. Compared to our last ports (Hong Kong, Shanghai, Beijing, Seoul), Nagasaki is small, about half a million population. Nagasaki is clean and easy-to-navigate, with an efficient tram system, lots of signs in English, and traffic signals and crosswalks that pedestrians and drivers actually obey. 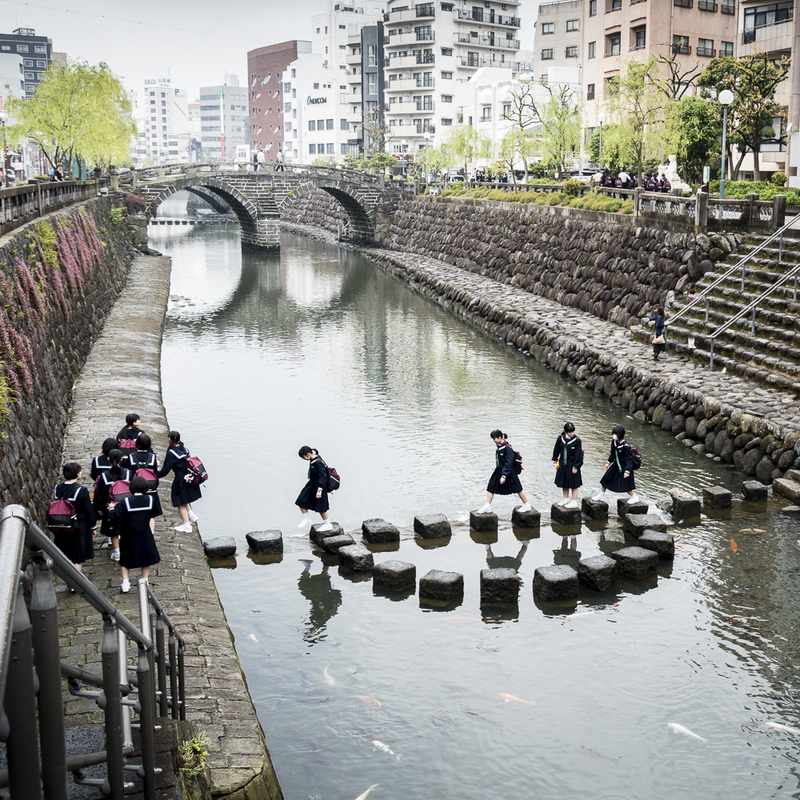 Spectacles Bridge, an arch-shaped stone bridge across the Nakashima River is a popular spot, full of giant carp. A Taiko drum performance by Ishaya Tenman Taiko and a send-off by a local school band were the highlights of this port. The energy, talent, and politeness of these young people brought tears to our eyes. Kagoshima is Japan’s southernmost city and has been voted its friendliest city in national polls. Sakurajima volcano puffs away across the bay, and our goal was to see it up close. 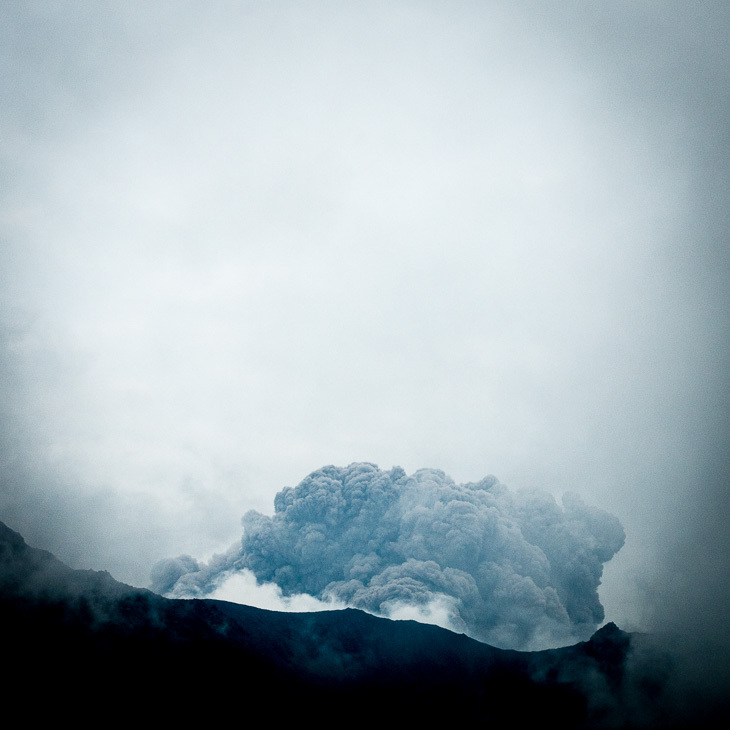 Mount Sakurajima has been spewing a continuous stream of smoke and ash since 1955, and it’s not uncommon to have over one thousand small eruptions per year. Getting there is easy: we purchased a “Welcome Cute” one-day pass (good for all buses, trams, and ferry routes), then boarded the 15-minute ferry to Sakarajima. The 3-km Nagisa Lava Trail winds along the coast, with plaques telling the story of the 1914 eruption, which covered the city centre with a deep layer of ash. 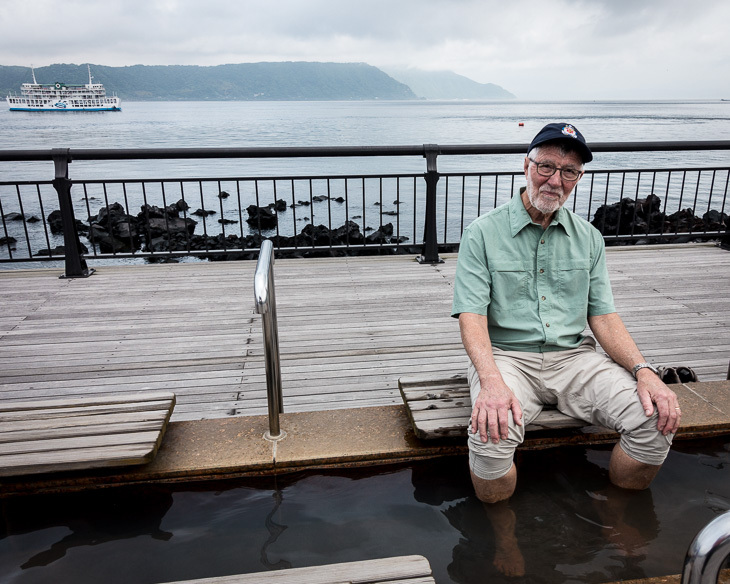 Doug dipped his toes in the Foot Spa, one of the longest footbaths in Japan. At the end of the trail we boarded the round-island tourist bus. At Yunoshira Observatory the clouds parted, and the volcano huffed and puffed just for us. Taxi driver Lin Dong Li speaks no English, and our Chinese vocabulary is limited to “xie xie”, which means thank you. 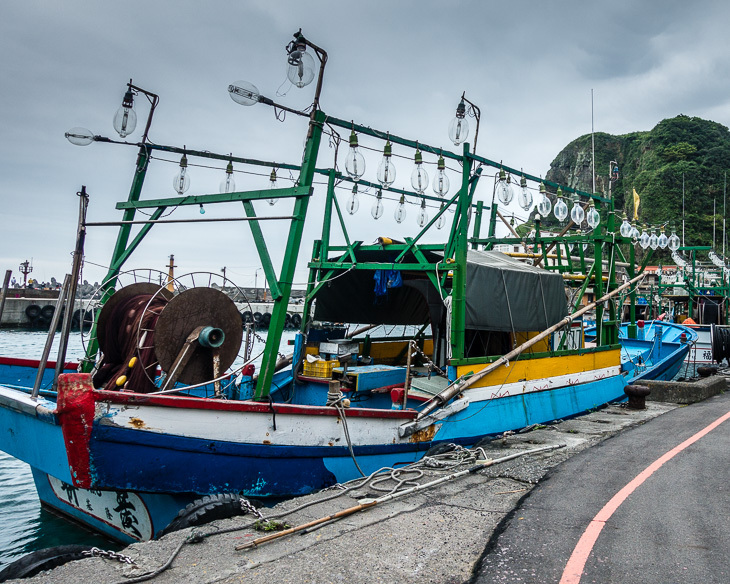 With sign language and a google map, the three of us navigated from Keelung to the starting point of Bitou Cape Lighthouse Trail, which had been recommended in our Lonely Planet guidebook. Mr. Lin laughed, which we interpreted to mean “no, thanks”, when we invited him to join us for the hike. His laugh must have meant “wait a minute,” because he soon caught up to us, having collected a dozen cookies and a change of shoes from the trunk of his taxi. 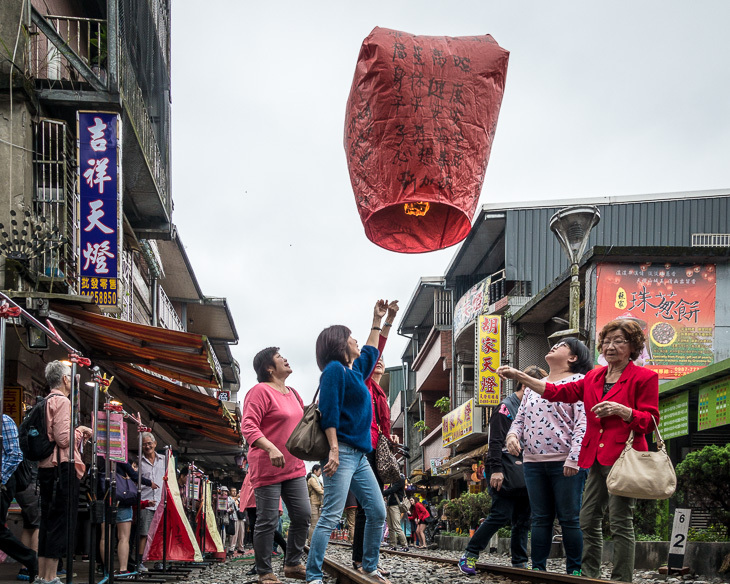 After a scenic one-hour hike to the cape, Mr. Lin drove us to a few other sites he thought we would enjoy: Happy Lantern street (a magical place where hot-air lanterns are launched), Shi Fen Waterfall (popular with local tourists), a temple, and a fishing village. Bottles of orange-coloured drink (shake first), a chocolate bar, and a large basket of cherry tomatoes were provided for us along the way. Xie-xie, Mr. Lin! If you are passionate about temples and pagodas, this is the place to visit. Kaohsiung (say “gow-shung”) is an industrial city on the southwest of the island, a little off-the-beaten track. 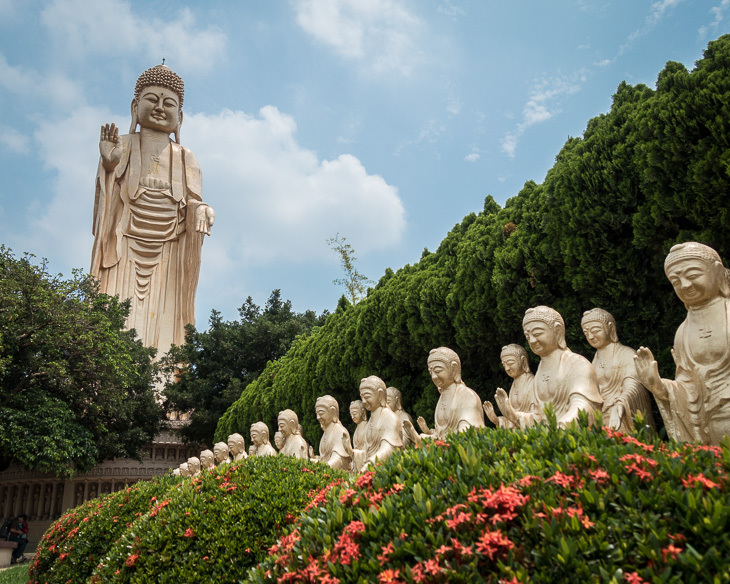 In Kaohsiung we visited a Confucius Temple and another Taiwanese temple where several different gods are worshipped. The main attraction, however, was in nearby Fokuanghan, a famed and wealthy centre of Buddhism. Built into a mountainside, the older portion of the Fokuanghan monastery is filled with thousands of photogenic statues; Big Buddha Land is well worth the climb. The new section is an immense complex which feels like a Buddhist convention centre/theme park: an array of temples, meditation halls, gardens, religious artifacts, and 4D movies. 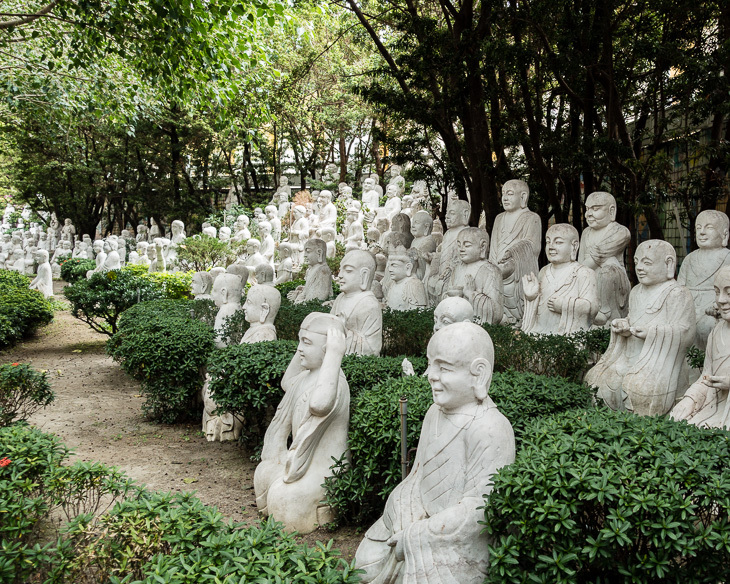 The goal of the Centre is to make Buddhism relevant to modern life, often through charitable work. Fund-raising seems to be going well. “Today you are all vegetarians,” said Mr. Lee, our guide. Our tour included a delicious vegetarian lunch. At least twenty different, elaborate dishes were on the table, and we didn’t have to eat in silence. Buddha never ate this well, at least during his ascetic period. 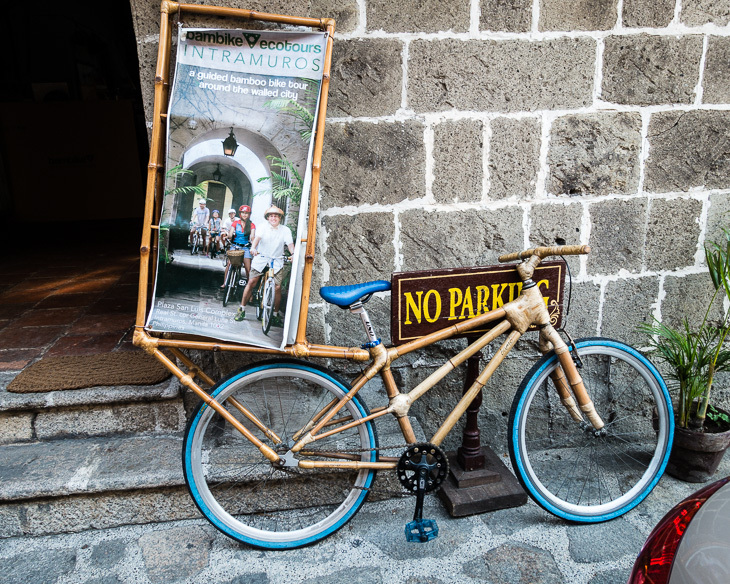 “It might be hot,” said Doug, so we chose Old and New Manila, a tour that promised an air-conditioned bus. It was hot – 98 degrees F – and the streets of this great port city were extra crowded as parade floats and dancers assembled for a Mardi Gras-like festival called Aliwan. The American Memorial was deeply moving. 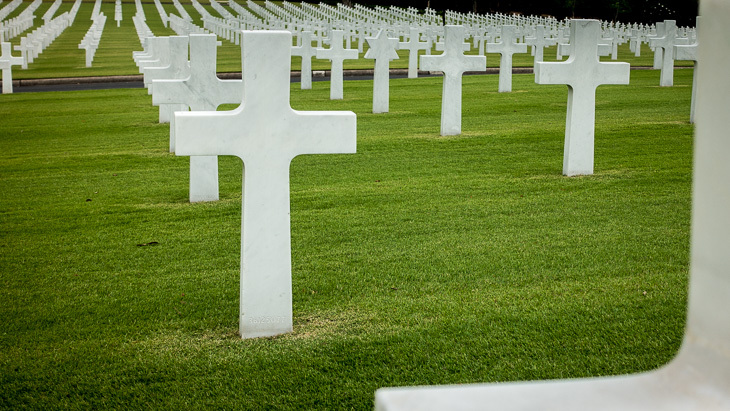 This is the world’s largest World War II burial ground, with more than 17,000 soldiers, each grave marked with a marble cross. The names of 36,000 other soldiers are engraved in the walls; their bodies were never found. Huge maps outline the major battles of the Pacific theatre. No, we did not see the shoe collection of Imelda Marcos. Nor did we sample balut (fertilized duck eggs featured on Fear Factor) or fresh-popped cicheron (deep-fried pig entrails). Maybe next time. Oceania Cruises reads their comment cards and acts on them – promptly. On his mid-cruise feedback form, Doug mentioned that a steady diet of elegant food left him craving a peanut butter and jelly sandwich, on ordinary brown bread with the crusts left on. One hour after depositing his card in the guest comments box, the head chef called to say a tray was on its way to our stateroom. You guessed it – a peanut butter and jelly sandwich! Next time Doug is going to ask for eternal peace. This entry was posted in Asia, Boots, Cruise, Japan, Korea, Philippines, Taiwan and tagged DMZ, Fat Man, Manila, Nagasaki, WW II. Bookmark the permalink. Stunning photos once again! And I like the idea of requesting World peace – you never know! Thank you for your comments, Liz. Let’s try every angle possible to accomplish peace.